The cTrader market trading clock displays the global trading hours (trading sessions) for each of the 7 major stock exchanges in the world used by cTrader, configurable to show or hide, markets that are currently open, the opening and closing times, alarm bell when market opens and a countdown timer when market is about to open. This indicator displays the global trading hours (trading sessions) for each of the 7 major stock exchanges in the world used by cTrader. Why do you need to use a market Trading Clock? this clock allows investors from around the world to trade during normal business hours, after work or even in the middle of the night. You can choose between your local timezone opening and closing times for the exchanges or the actual local times for New York, London etc. You can also show/hide the location label which is displayed on the left of the screen. You are able to select either your local timezone or the actual local times of the exchanges. * Alert market opens: how many minutes left till market opens, a countdown timer will be displayed under the clock. Date and time order from left to right, so that closed markets are on the left of the highlighted open markets and markets about to open are on the right. Show clock in your current timezone or the local exchange timezone. sends you an email (x) minutes before an exchange opens. User-defined colours for the open and closed clocks to suit your background colour. The user-defined sound when a market opens, this can be any file located on your computer, so you can use a real exchange bell sound. Show or hide the timezone location label. Optional display of opening times for each of the exchanges. Clocks show the market closed message with all clocks in a closed state at the weekend. Option to display closing times. Option to display the alert when the market is about to open with a countdown timer. FxPro Midnight Inactivity message, trading stops for 5 minutes. Easier to add additional exchanges. Default Clock View - showing exchanges open, closed and when they open next in minutes. 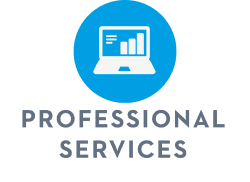 FXPro Customers Note: They currently halt trading for 5 minutes each night at midnight (Cyprus Time), as this is the time that the daily trading session finishes for their Liquidity Providers. At this time each night, the Liquidity Providers carry out their own daily reconciliations and withdraw their pricing for a very short period of time while this is carried out. Due to this temporary withdrawal of liquidity we see a widening of our spreads and a reduction in the liquidity available for their clients, in order to prevent their clients being affected by these abnormal market conditions they prefer to suspend trading until 00:05 when the Liquidity Providers have all returned pricing. Please be aware that if you change the font size on cTrader it will cause issues with displaying the clock correctly. 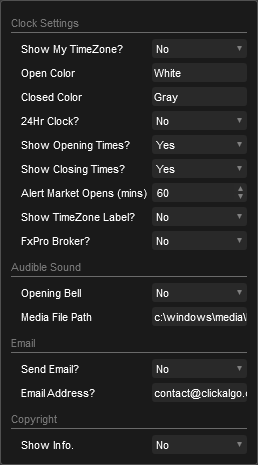 You can download a sample opening bell from the link below to add to the Market Trading Clock, the indicator will allow you to use any sound file. * Just copy the file into a folder on your device and add that path to the Media File Path in the indicators parameters input field. This clock was well worth the money, I use it on all my charts. thanks a bunch.